The power of active listening can’t be overstated. It gives us increased leverage with colleagues and employees, increased reliability, and results in effective teams. We all like to think we are good listeners, but we don’t always demonstrate this quality in our day-to-day conversations. How many times have you zoned out in the middle of a meeting, missing minutes of a colleague’s presentation before you realized your mind was wandering? How many times have you nodded blankly while an employee updated you on a project because you were really thinking about your own to-do list? With just a little extra focus, you can break these habits and become a better listener. Actively listening to your staff is the first step toward engaging their full participation in your organization’s goals. It is then vitally important to properly acknowledge the ideas and suggestions that are received. All ideas are valuable. You never know when one might bump up against another to create a spark that ignites. At EDSI, we know that active listening is a learned skill that is often overlooked. 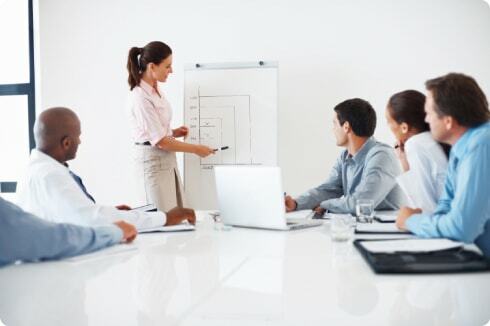 Our listening skills training programs help leaders acknowledge what employees are saying, evaluate organizational communication up and down the chain of command, and recognize deeper messages hidden within that communication. Our Listen First to Understand Facilitator Guide and Participant Workbook, and the course, Communicating to Manage Performance are designed to focus attention on creating a climate of employee engagement through authentic communication and active listening. It gives attendees practical strategies that they can put into effect right away, including teaching active listening, exposing “active listening flaws,” and properly acknowledging ideas and contributions. We have been resolving employee development, leadership, generational, professional presence, and personal effectiveness issues for over 30 years. Contact us to learn how we can help increase productivity and profits in your organization. 800-282-3374.